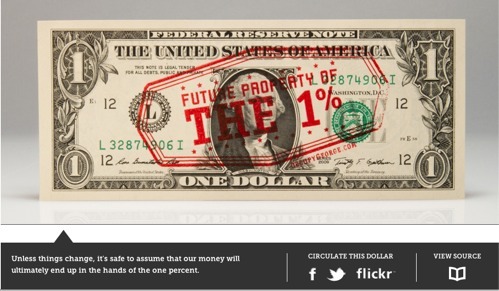 Occupy George is circulating stamped dollar bills that feature fact-based infographics to inform the public of America's economic disparity. "Money talks, but not loud enough for the 99%," the Occupy George page writes. "...Because money knowledge is power." LAUNCH has contacted Occupy George and will update this story if we receive a response. Read LAUNCH CEO Jason Calacanis' editorial on Occupy Wall Street, and Senior Director of Content at Ranker Lon Harris' response. Occupy Wall Street protests began Sept. 17th in New York City. Since then, the movement has spread to more than 100 cities. 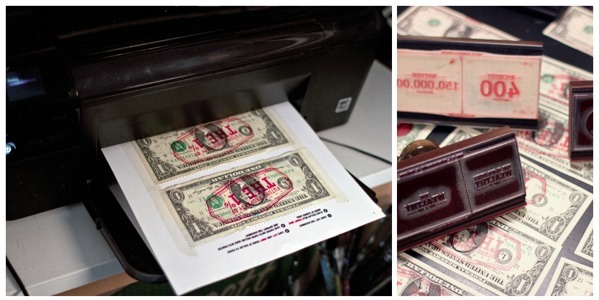 The stamps at Occupy George. Occupy George provides detailed directions on how to attach the stamps to your own money.